Nassim_2 I had the pleasure of being in scientist-philosopher-mystic Nassim Haramein's session at the Institute of Noetic Sciences conference a while back. His was one of the most interesting presentations. A multi-dimensional pioneer, he is working on a unified field theory he calls the �Holofractographic Universe.� I deeply resonated with what he was saying - not through the lens of a scientist, but through my lens of the living, fertile, fractaled, integrative, shape-forming, creative universe. He has mathematically and scientifically discovered what creators and mystics have always known - that we create by feedback and change and that we are all beings of infinite creative potential - in a very literal sense: the vacuum is not empty - it is not nothing. It is actually highly organizing and always communicating - an "unknown" that is actually fertile with creative potential. He founded The Resonance Project Foundation. You can see him speak on the Crossing the Event Horizon video on YouTube. The Holofractographic Universe theory is a unified field theory resulting from over two decades of investigation into the geometry of hyper-dimensional systems and their relation to the creation of three-dimensional reality and all of its forces�including consciousness. Nassim's investigation of the geometry of hyperspace has combined quantum physics and cosmological understandings of universal forces with other sciences such as biology and philosophy, resulting in advanced unification computations that, astonishingly, relates to ancient codes left in monuments and documents around the world�including the Bible, the I Ching, the Mayan Sacred Calendar, Pyramids, and Egyptian temples. The results of his research may bring our planet to a new dimension of understanding and existence, one which was predicted by the ancients to arrive at this time in history. If we get bigger here I can probably cajole him to come and do a Q&A. I like Nassim too. Enjoyed the Youtube video's, when I have more time, I will go back and re-watch them...so much to absorb. Most definately! I love Nassim! He said if we don't get ourselves in sympathetic resonance with the energies coming our way, there's a big chance we can get extremely sick. He knows so much! Nassim is brilliant. The guy talks so much sense and has a knack of making things simple � a total genius. I especially love what he says about living in a black whole. BTW, he�s half Iranian if anyone is interested in his full background and has some wonderful anecdotes about his dad. I'm pretty sure i've seen Nassim refer to black holes as black Wholes (with a W to make a point of everything being whole). I remember the first time I found his 64 video youtube lecture, once I started watching it I couldnt stop. I also remember that he talked briefly about how his findings led him to develop his own form of meditation and someone asked him to talk about it. He said one day he would. Has anyone got any information about his meditation techniques?? He runs retreats to do his meditation techniques which is quite expensive - not sure if he's got them out on dvd yet. gita,Mar 15 2010, 05:12 PM wrote: I'm pretty sure i've seen Nassim refer to black holes as black Wholes (with a W to make a point of everything being whole). Yes indeed he does Gita! Let's say he has a most "wholistic" approach to science! Years ago when I was just a wee lass I was turned onto science and fell in love with it as a passion... Science and spirituality are closely entwined as one explains the how. Amazing. I'm going to Sedona today to stay on a ranch with this wonderful psychic/exorcist for a week, and she's going to be getting me in personal contact with Nassim to discuss my work. I am absolutely psyched. I have admired Nassim very dearly and my own research is based off his initial concepts. Whoa - Can You tell Him something ? Tell Him this if You can. If You can give Him this Message It would mean alot to Us Gregor. Take a look in the mirror....and try to see ME. Hi there, just entered this Forum and found some lovely topics here. I am very fond of Nassim and admire his ability to keep things simple and also his hilarious humor in his lectures. He is just being himself, almost amazed by his own findings, sort of, like a child but a very clever and intuitive one! David Wilcock has included Nassim in the film that he's making now, for those interested, David's site is www.divinecosmos.com I guess most Mistics here know about him. I am excited about the bleeding through of spirituality in the scientific world! Up till now it has been mostly fragmented pieces of material quality and it lost a lot of life and vitality. Now the spark is returning bringing life back where it should be: heaven and earth united. Enjoy your weekend, be well! Absolutely awesome vid and very funny also. A must watch for those that want to understand the universe. 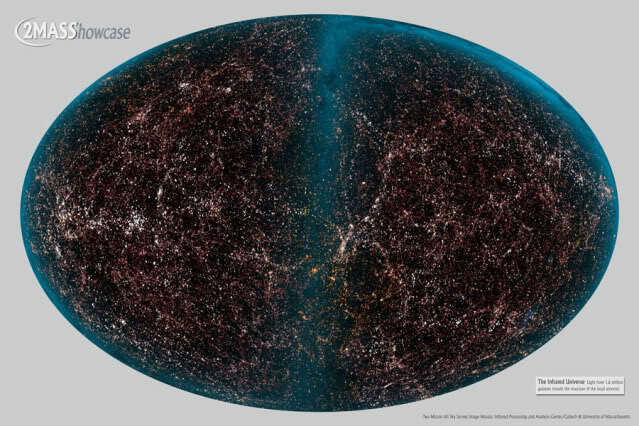 Explanation: Are the nearest galaxies distributed randomly? A plot of over one million of the brightest "extended sources" detected by the Two Micron All Sky Survey (2MASS) shows that they are not. The vast majority of these infrared extended sources are galaxies. Visible above is an incredible tapestry of structure that provides limits on how the universe formed and evolved. Many galaxies are gravitationally bound together to form clusters, which themselves are loosely bound into superclusters, which in turn are sometimes seen to align over even larger scale structures. In contrast, very bright stars inside our own Milky Way Galaxy cause the vertical blue sash. This helps to visualize Nassim's talk. I hope this works, here. It should have the entire series on Unified Field Theory. Just click the screen in the upper left and the videos should scroll like a music player. Thank you for sharing Nassim's work with us. Such a bright shining soul.